This historic machine is very sprightly considering its age. 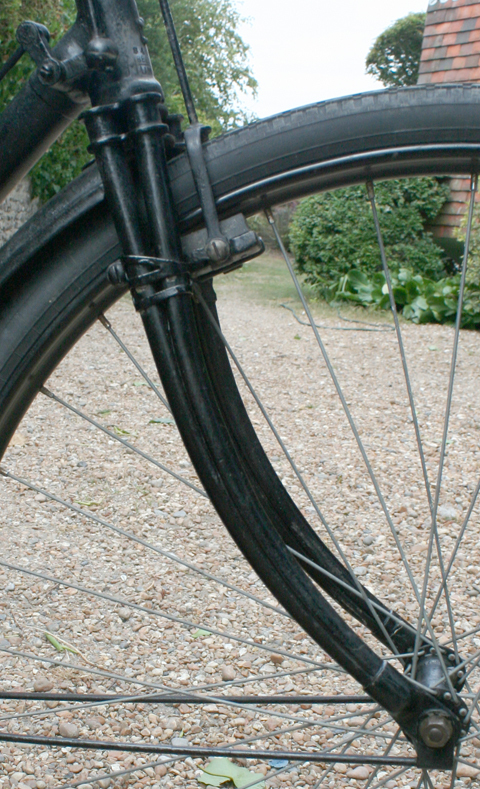 Despite being manufactured a few months after Queen Victoria passed away, it is so well-built and designed that you can still hop on it and pedal off for many miles without any problem. As you can see, it’s set up for touring. 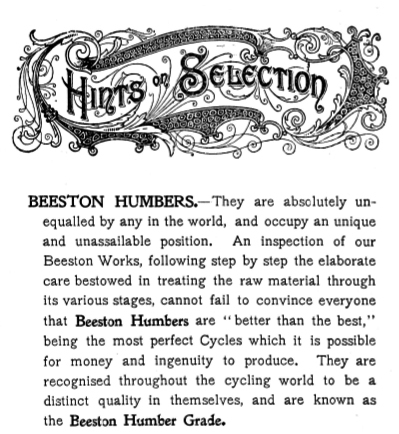 By the turn of the century, Humber were turning out between 7000 and 9000 Beeston bicycles and tricycles, such was the reputation of their machines and their popularity with the public. 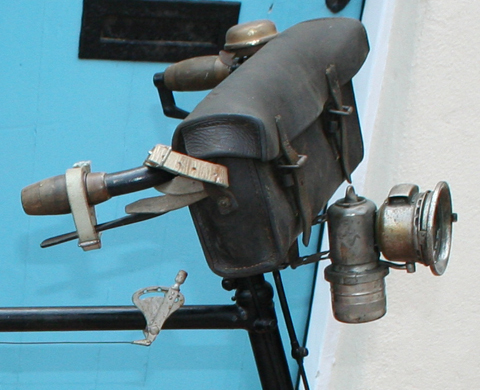 This is the top-of-the-range Humber model, being a Gents Light Roadster Tricycle with the added advantage of a removable crossbar so that a woman can also ride it if she so wishes. 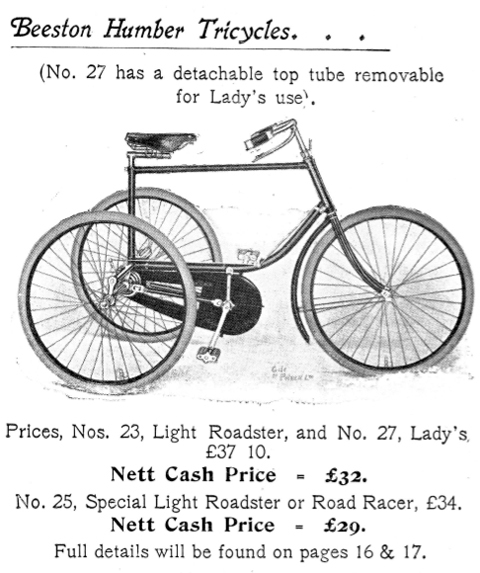 This feature is particularly interesting because, although, without its crossbar, it would then become a ‘Lady’s tricycle,’ the design remains distinctively male, its large frame set off by the vertical seat-tube. 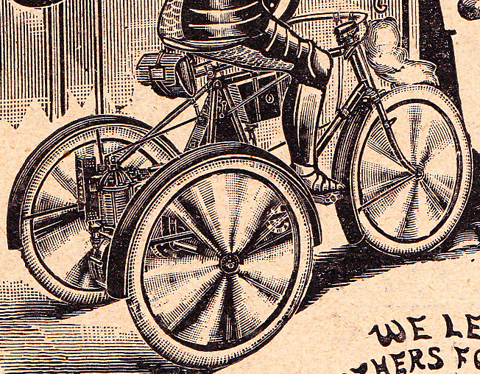 Because tricycles are normally either male or female, this poor fellow would therefore appear to be somewhat challenged in the gender department (though such a state of affairs would not have been openly debated in 1901). 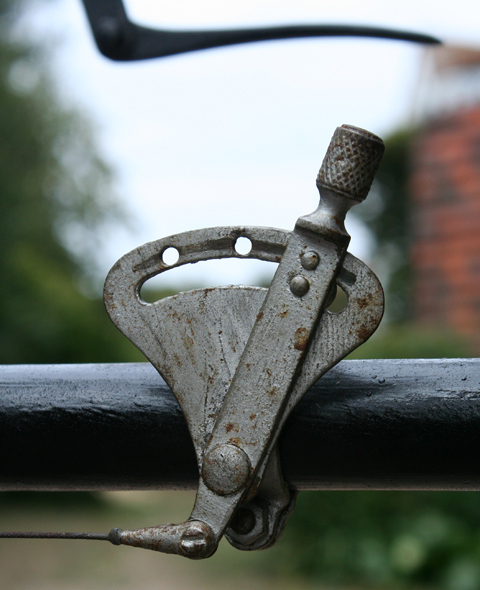 It has a Lady’s central mounting plate, which you can see above and below. 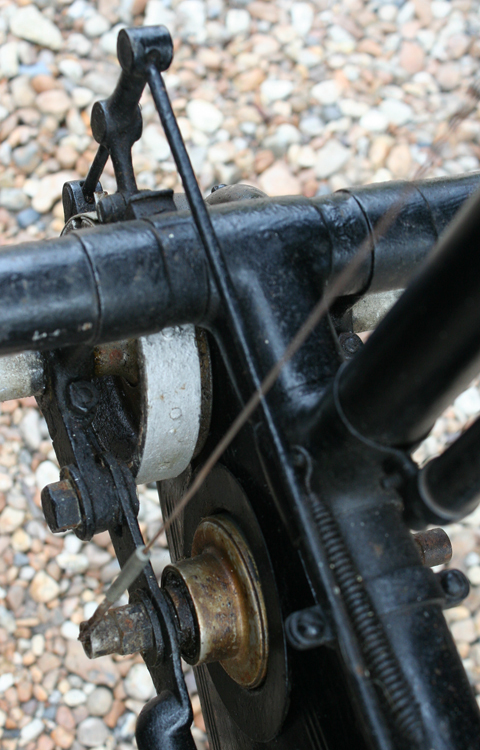 And, of course, being a hermaphrodite of a tricycle, it also provides step plates either side on the axle for gentlemen to mount from the rear. My personal preference is for Gent’s bikes, no doubt because I’m a bloke, but also because they’re large, imposing machines; crossbars give them a more dynamic appearance. 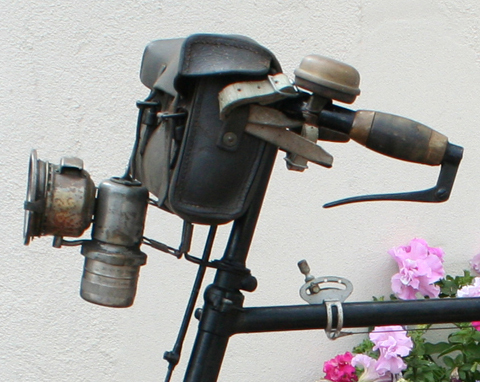 This Beeston is now more of a ‘fixed convertible’ – it was returned to the factory some ten years after manufacture to be fitted with two-speed gears; with the trigger mounted on top of it, the crossbar is therefore bolted firmly into place. 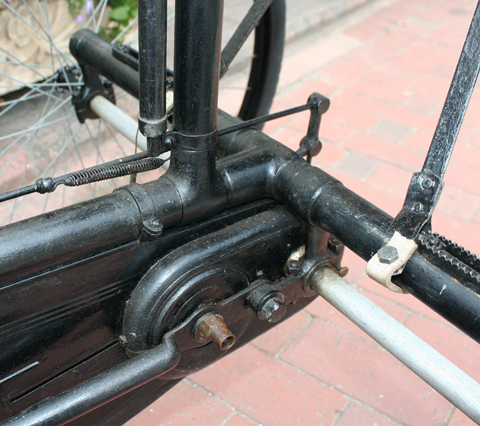 Toward the end of the 19th century, Humber was arguably the market leader in tricycles. 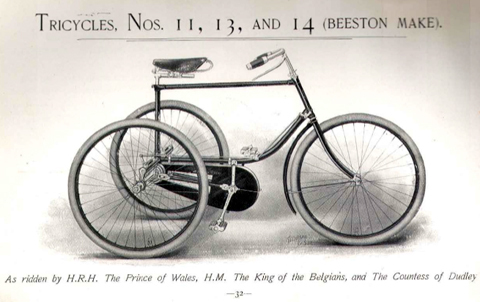 An indicator of such status was that the Beeston tricycle had already been adapted to accept an engine. 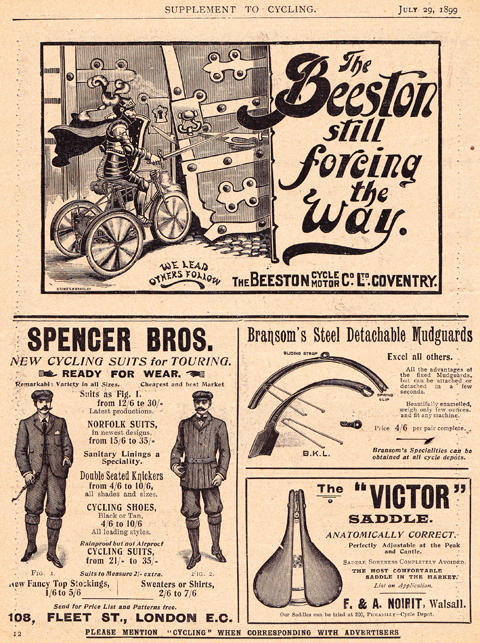 As it states in the 1900 catalogue below, the company had been fitting engines to their tricycles and quadricycles successfully for two years. 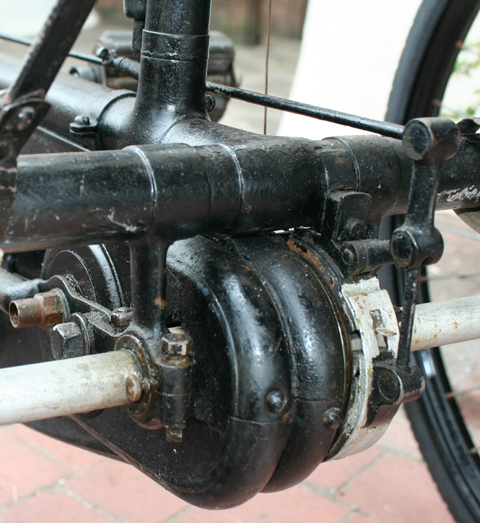 The motorized Beeston Humber was Great Britain’s first successful ‘automobile’ and you can still see examples in action at the annual London-Brighton Pioneer Run. 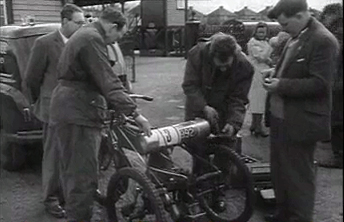 Below is an 1899 Beeston Tricycle photographed at Tattenham Corner in the 14th Pioneer Run of 1950. 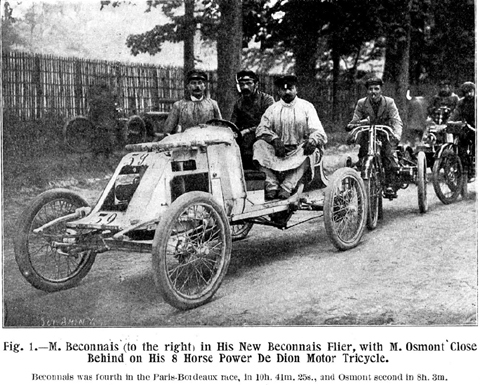 As you can see below – and as was common in those earliest days of motoring – the motorized version is remarkably similar to the pedal-operated tricycle. 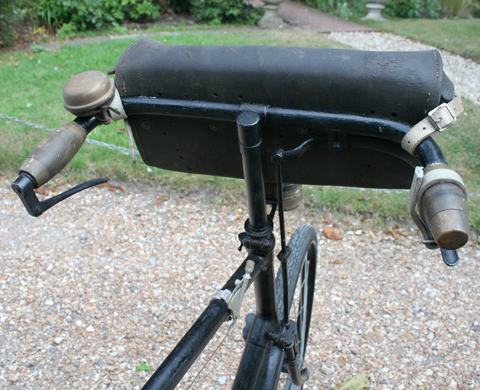 Though the large leather holdall is rather ungainly mounted on the handlebars, there’s nowhere else to put it. 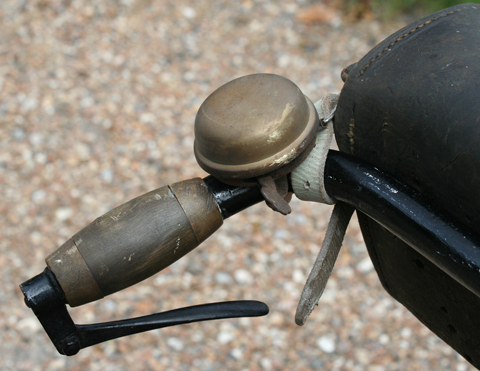 Observe the ‘handbrake’ – a leather strap that rests on the right handlebar and is pulled forward onto the grip to apply the brake when the tricycle is parked. 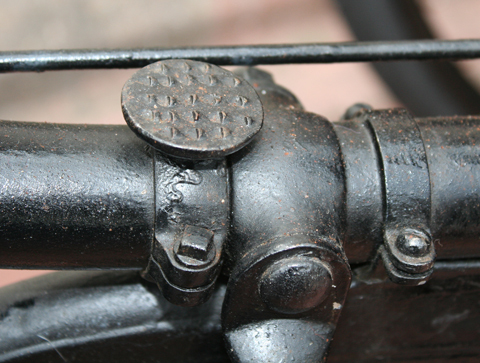 …and the inverted left lever is for the front brake. 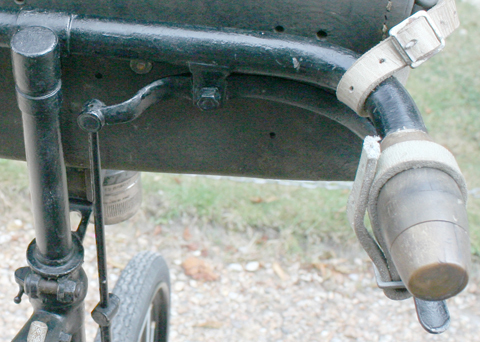 Most manufacturers still used spoon brakes at this time; Humber offered a rim brake as an option. 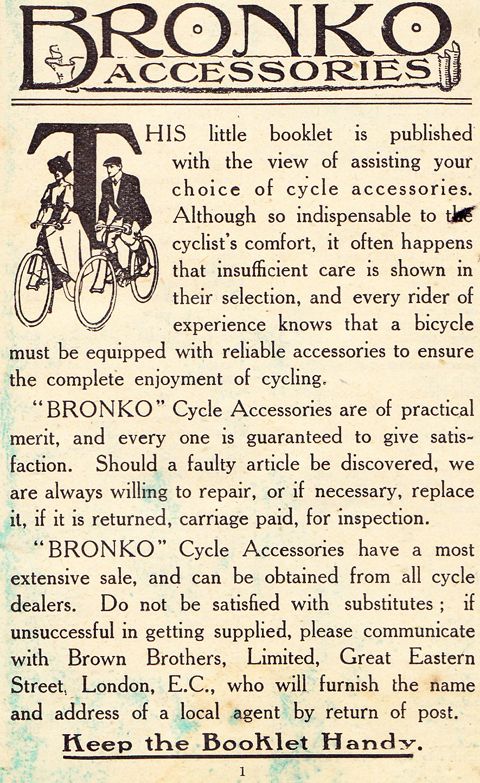 The ‘extras’ list further down the page shows there was an extra cost of £1 for front brakes. The basket at the rear opens up to reveal a child carrier. 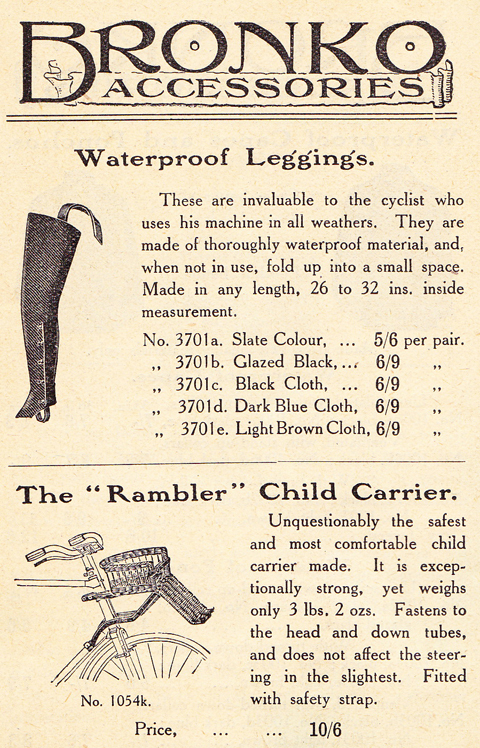 Bronko’s ‘Rambler’ Child Carrier was priced at 10/- 6d. 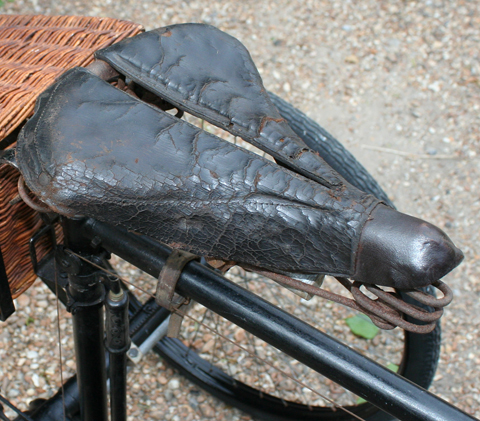 As you can see, they are normally fitted to the front, but I found that mine was more secure fitted to the rear of this tricycle. 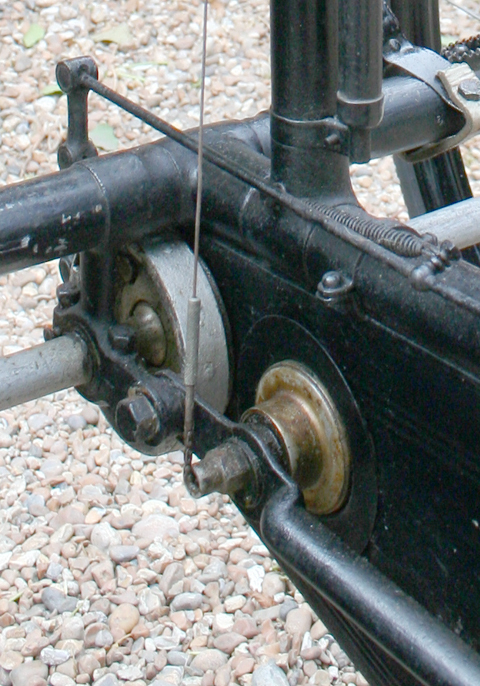 Below you can view an illustration of the Humber-Cordner three speed gear as fitted to Humber tricycles and introduced in 1906. These photos were taken around Rottingdean, a two mile ride from my house. (Beach pictures were at Hove). 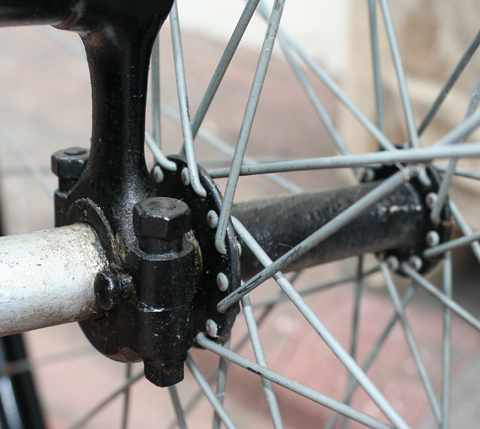 Tyres are 26 x 1 1/2 (650B). 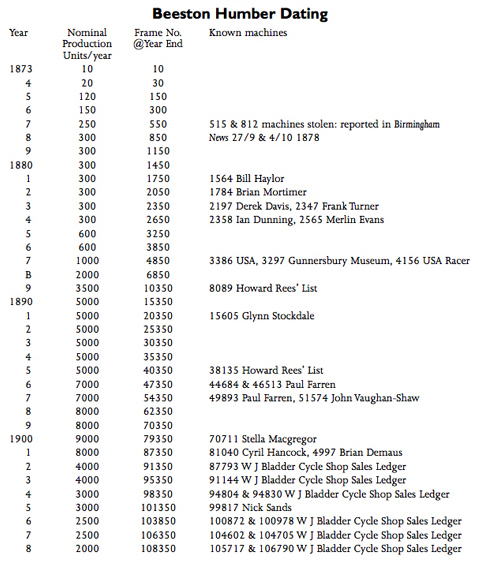 Though the model numbers were different in 1898, the machine was essentially the same. 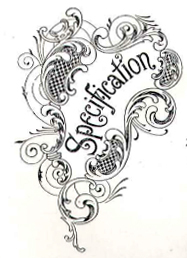 The specification in the 1900 catalogue is not very clearly laid out, so I’ve reproduced the 1898 version below so you can see the spec more easily.